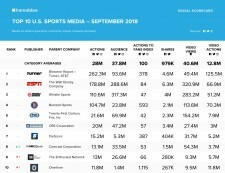 NEW YORK, October 9, 2018	(Newswire.com) - Shareablee Inc., the global leader in audience-based social media measurement, today rleased their September ranking of the most socially engaged sports media brands across the United States. 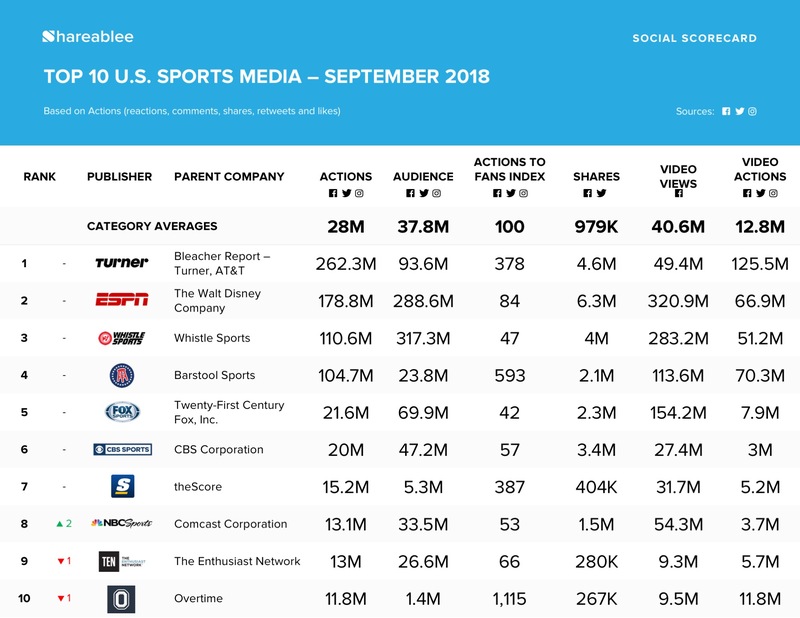 Sports Media represented a total of 785.3 million actions (post-level reactions, shares, comments, re-tweets, and likes) across Facebook, Twitter, and Instagram in September. AT&T’s Bleacher Report – Turner Sports Network once again led the ranking with 262.3 million actions, followed by ESPN (178.8 million actions), Whistle Sports (110.6 million actions), Barstool Sports (104.7 million actions), and Fox Sports (21.6 million actions). The top seven ranks remained constant from August’s rankings, while NBC Sports overtook the eighth spot with 13.1 million actions, followed by Ten: The Enthusiast Network with 13.0 million actions and Overtime with 11.8 million actions. ESPN ranked first in the video category, with 320.9 million views last month, while Bleacher Report – Turner Sports Network had the highest video actions (125.5 million). Among their respective audiences, Overtime had the highest Action-to-fan index (1,115), followed by Barstool Sports (593), and theScore (387).